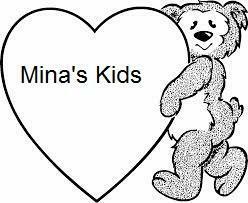 Mina's Kids, is committed to providing our community of families with quality childcare to children of all ages in an ideal atmosphere that enables children to grow mentally, physically, emotionally and confidently. Therefore it is our obligation and commitment to provide quality childcare in a safe, clean, healthy, nurturing, and nutritional environment while assisting children to grow with confidence in a multi-cultural and multi-racial atmosphere. Along with these attributes, children will be given a positive place where they can interact with other children while feeling safe and secure in their surroundings. Here they will be allowed the latitude to discover and explore their surroundings. This creates a naturally nurturing environment where children learn through play. In order to achieve this goal we must use other key elements such as creating positive relationships. Communication and confidentiality are some important tools we use to meet individual family needs, allowing us to recognize a child’s natural ability and any potential needs in each child’s developmental stage. Communication with parents and our community keeps us informed of each family’s needs and concerns, which in return will ensure we provide quality childcare and other resources to support your family. Together we will provide quality childcare and education each child deserves. We encourage children’s creativity and construct age appropriate Curriculum and Development with cultural awareness that creates wonderful learners. The children of today are the men and women of tomorrow. Our Child Care Centers are based on the belief that our customers' needs are of the utmost importance. Our entire team is committed to meeting those needs. As a result, a high percentage of our business is from repeat customers and referrals. Our services have been used by our community for over 18 years. We provide quality Infant, Toddler, PreSchool, Pre- Kindergarten, and Before and After School Child Care programs. Thanks so much for visiting our site! We wish you the best of luck in your search for care for your child and family! Here we believe in modeling courtesy, kindness, and empathy as well as encouraging important moral values. Every day, we will promote and reinforce positive behavior, set appropriate boundaries, and provide opportunities to cooperate with peers and verbally solve interpersonal problems. By doing so, we believe that children will develop essential social skills that will last a lifetime.